Located at the historic Woodley Airfield air base near Reading, the museum showcases Berkshire's contributions to the history of aviation through rebuilt aircraft (featuring locally built Miles and Handley Page planes), displays of archival photographs, and hands-on chances to experience the development of aviation techniques. In the early 1930s, a 100-acre field owned by Sandford Farm in Woodley was converted for use as an airfield and flying school. In 1932 the Miles Hawk began production at Woodley. Among early aviators to visit the Woodley Aerodrome were famous pilots Amy Johnson and Charles Lindbergh, who came to Woodley in 1927 and bought a Miles Mohawk plane. Over the next 3 decades over 6000 aircraft, both military and civilian, were built and tested here, and many pilots were trained on the Miles Master aircraft produced at Woodley. The airfield closed in the 1960s and much of the site was developed for housing. 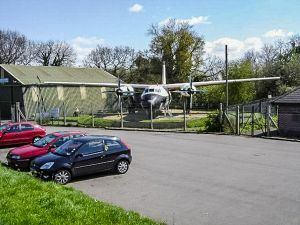 However, the airfield and its role in aviation history live on at the Museum of Berkshire Aviation, which occupies the southern section of the old airfield site. Most of the museum's focus is on the history of the two major manufacturers that made Woodley so important in early aviation history; the Philips & Powis company and Miles Aircraft. Most of the aircraft on show come from these 2 companies, but other planes on display were built by the Handley Page and Fairey Aviation companies. Some of the exhibits are unique; including a WWII target tug, and a very unusual Fairey Jet Gyrodyne - a combination autogyro and helicopter. Other exhibits are a Miles Student jet trainer - the only example ever made - and a Miles Martinet. See a Handley Page Herald turboprop, built at Woodley, and a Miles Magister twin seat training aircraft. Another model on show is a Fairey Gannet anti-submarine aircraft used by the Royal Navy. Aside from the actual aircraft, the museum has exhibits on the people and the companies that called Berkshire home. And they aren't all recent; for example, did you know that the first known aviator from Berkshire was Rev. John Bacon, who used a balloon to carry out scientific experiments at the turn of the 20th century? And did you know that Geoffrey de Havilland, who would go on to found the famous Havilland aviation firm, taught himself to fly near Newbury in an aircraft he designed himself? One of the more unusual exhibits is an unexploded German bomb found in 1999. The bomb, weighing a staggering 1000 kilograms, was dropped on a farm field near Woodley in 1941 but not discovered for another 50 years. The museum has different opening times and days at different times of the year so it's a very good idea to check the official website before making travel plans.